Let me just start by saying that I have no idea where I got this recipe. I've seen it on several sites, and I honestly have no idea who should get the credit for it. 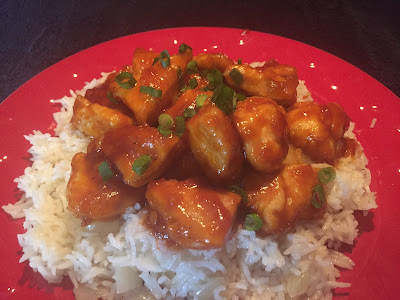 At first, I saw it labeled as 3-ingredient orange chicken. But the thing is, there are more than three ingredients! So I decided to just call it orange chicken. Fair enough? And OMG wait'll you taste it. It's REALLY delicious. You know how take-out sesame chicken has that sort of sweet and sticky thing going on? This has pretty much the same kinda vibe, only it's more tangy, and has that yummy hit of orange. Also the soy sauce and chopped scallions help to balance all of the sweet. The first time I made it, I couldn't stop eating it. And when my friend AJ helped me test it, he had that MMMMM expression on his face from the very first bite. You could even just make the sauce and use it as you would regular BBQ sauce when cooking different kinds of meat on the grill. It's just that good. Definitely give this one a try! So thank you, mystery person, for coming up with it in the first place! It's now one of my new favorites recipes! In a small bowl, mix the BBQ sauce, marmalade, and soy sauce. Set aside. Cut up the chicken breasts into cubes and place in a large bowl. Add beaten eggs to coat chicken pieces. Place flour and/or cornstarch in another bowl. Dip pieces of egg-coated chicken in flour/cornstarch, tossing to completely coat. In a large saute pan, add enough oil to coat the bottom of the pan. Over medium high heat, cook the chicken in batches, just until slightly browned on the outside, but not all the way cooked through. After you remove your last batch of chicken from the pan, pour the sauce in, being sure to scrape up any browned bits. Add the chicken back to the pan and toss to coat. Reduce heat and then simmer for 5 minutes, just until the chicken is finished cooking through. Top with chopped scallions. Serve over rice. Usually, if I'm using purchased orange marmalade, it comes in a 12oz jar. So I usually just increase the whole sauce recipe by half, which uses the entire jar. (1 1/2 cups BBQ sauce, 1 1/2 cups marmalade, 3 tbs soy sauce). Be sure to serve with the chopped scallions on top. They're more than just a garnish! That little hit of mild onion flavor is key! If you'd like to use the sauce on its own, (it's great on pulled pork or grilled chicken!) place the sauce ingredients in a small saucepan and then simmer over low-medium heat for 10-15 minutes, just to blend the flavors and mellow out the sharp bite of the orange peel. For extra delicious rice, saute a small chopped onion in a little oil, then add dry rice. Toss to coat. Add twice as much chicken broth as rice (instead of plain water). Reduce heat, and cook until broth is absorbed, about 15-20 minutes. For an extra spicy hit, add a few crushed red pepper flakes to your sauce!